The table of reserved ranges has been copied from the subnet details page where the user can reserve a range in the specific subnet he is in. In the VLAN details page the user should be able to select which subnet of the VLAN (s)he wants to reserve a range from. 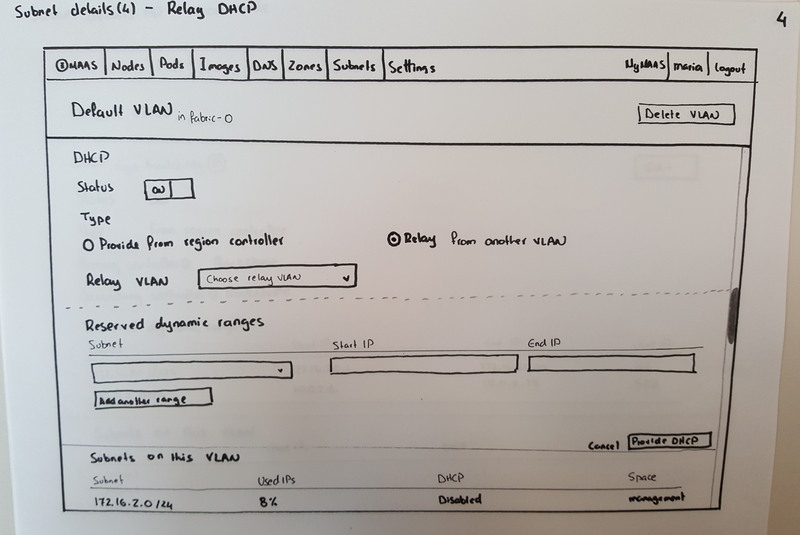 Note that the sketch doesn't have pre-populated subnets, however the desired behaviour is to have a default value for the subnet, the start and end IPs. I actually re-read this and I feel this is an invalid or wontfix. You *dont* have to select a subnet to be able to do things inside that subnet. Mark S also requested that we remove this complexity that in order to do things, we needed to specify which subnet we are doing things on. Simply enough, the user only needs to input IP addresses to auto-determine in which subnet things are, hence adding a subnet selection mechanism just over complicates things. The main purpose of the dropdown is to help the users see which subnets are available to reserve IPs from. Otherwise they will have to keep looking to the section below (Subnets in this VLAN), which will make this task annoying and time consuming. Even more so for a long list where it will be very hard for them to inspect all the subnets in the VLAN.